Step into a rental boat at many state parks almost as soon as your feet hit lakeshore. Let's start at the beginning. When you arrive at your chosen park, do you need to worry about waiting in a long line for your rental boat? The consensus is no. Says Tim O'Connor, owner and captain of Fisheagle Tours at Santee State Park, "At Lake Marion, it's first come, first served, but rarely will someone have to wait for a boat. If we know ahead of time that a large group is coming, we can get more boats to accommodate them. Right now, we have five or six canoes and as many kayaks, but the numbers are always changing." Folks fish from both types of vessels, he avers, and they especially like these smaller craft that allow anglers to paddle right into good fish hiding spots where bigger boats haven't got a chance. O'Connor has a lot of customers who bring their own boats to Santee but still need a second boat so everyone in the party has a seat. Moral of the story: If you own a boat, perhaps something with a little more than paddle power, by all means bring it to Lake Marion and enjoy jet skiing or hydrosliding, but if you're short on seats, you can always stow the overflow in a park rental boat. And, by the way, swimming off boats is allowed at Santee, which is not the case at all parks. You'll need to check with your chosen park on this point. While O'Connor favors canoes and kayaks, other parks, like Kings Mountain in Blacksburg, offer different choices, as Shea Joyner, park manager, explains: "We rent fourteen-foot johnboats, seven of them, for fishing on sixty-acre Lake York. 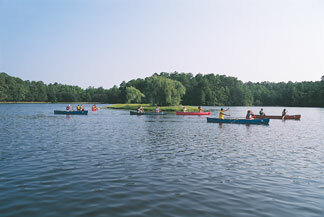 We also rent paddleboats and canoes during our peak season - May through Labor Day - for the smaller Lake Crawford, which is about nine acres in size." Angler alert: Fishing is permitted in both lakes, but on Lake York you can fish from a boat; at Lake Crawford you must stick to the banks. 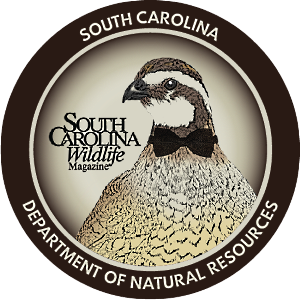 Drive to Sesquicentennial State Park, affectionately known as Sesqui to Columbia-area residents, and you'll encounter an array of rental-boat opportunities that will please most everyone. Park manager Daniel Gambrell and his staff stock four canoes, two single-person kayaks, three johnboats and eight pedalboats for your delectation. As is typical in the parks, rental is by the hour, so why not exercise those muscles in one type of craft for awhile and then try out another kind (and possibly another set of muscles) to finish your time on the water? And Gambrell has good news for those who love boating but hate toting boats: "If you're bringing a boat, it's a very short walk from the parking area to the lake; if you're renting a boat, the pedalboats are in the water already, and the canoes and kayaks and johnboats are right at the water's edge. A staff member will even put the boat in the lake for you." Once afloat, you'll find that each park's body of water has its pluses, but Shea Joyner is understandably partial to his own park's two lakes. 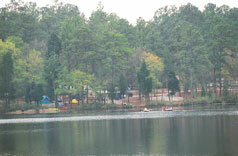 "What's neat about Kings Mountain," he says, "is that we have two different lakes with different purposes within the same park. 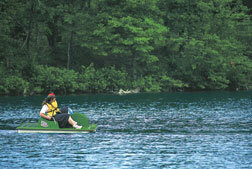 On Lake York, only johnboats are allowed, which attracts people who really want to concentrate on fishing. Lake Crawford, on the other hand, allows use of paddleboats and canoes, with fishing only from the banks, so it's more recreationally oriented. Also, you can sit out on Lake Crawford and admire the magnitude and beauty of the Civilian Conservation Corps' stonework as seen in the park's bathhouse." Additional waterside joys: Just by the bathhouse are some picnic pads and a couple of grills that may tempt you to dock your rental boat long enough for an alfresco lunch. What if you're not a fisherman or you're just tired of reeling in those sometimes-eight-pound bass at Kings Mountain? Let us postulate that Santee's crappie, catfish, bream, largemouth bass and shellcrackers have temporarily lost their charms. Then how about a little wildlife sighting from the vantage point of your rental boat? 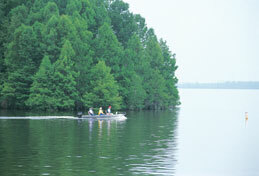 "Centennial Lake's beaver lodge is one of the most fascinating sights around Sesqui," says Daniel Gambrell. "It sticks out of the water probably seven feet high and ten or twelve feet wide and has been there four or five years. You can see the beavers coming and going and get a good look at them from a rental boat. Of course, you can also view geese, ducks and blue herons from your boat, and on the banks raccoons, possums and white-tailed deer sometimes wander into the picture." Santee's Tim O'Connor, who owns the park's tackle shop and boat-rental service, shares an expert's view of what you may expect to see on a personal paddling expedition across Santee waters: "In winter, watch for the threatened bald eagle and the endangered peregrine falcon. Migrating waterfowl such as mallards and pintails can be seen November through February. Throughout the year, you can look up and glimpse soaring red-tailed and red-shouldered hawks, and you'll sight a variety of songbirds in the trees, and wild turkeys." 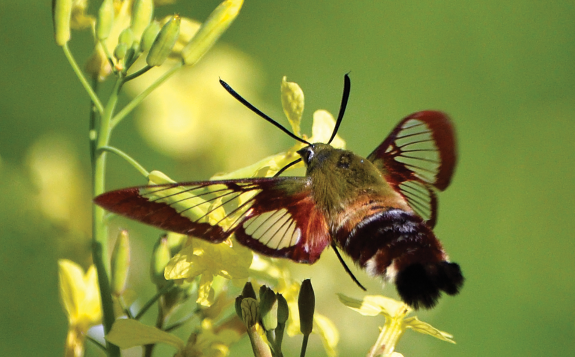 He adds that the forest affords a home to woodland creatures such as deer, bobcats and squirrels, while the ponds and marshes offer proper habitat for alligators and numerous other reptiles and amphibians. Anytime you're planning a rental-boat outing, take your cue from the Boy Scouts and be prepared because requirements for renting a boat vary at the different parks. It's therefore wise to check ahead for requirements at your chosen site. Some parks, for example, want to see a valid driver's license and credit card; others will ask for nothing but your age - and will take your word for it. Note also that hours and days of operation, types of boats offered, as well as fees and availability of boathouses and docks, can vary widely from park to park. Finally, if you're hoping to accommodate guests by adding the capacity of a rental boat to that of your own, remember that not all parks allow privately owned boats. Redline this great additional tip from Joyner: fall draws numbers of savvy boaters to state parks because there are few bugs, the fish are still biting, and the weather's not too hot - 70 to 75 degrees. Just perfect! Prepped and ready to go? 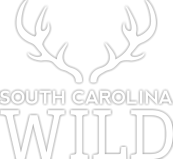 It's time, then, to explore the delights of renting a boat at South Carolina's state parks, like competing in Santee's Big Daddy Fishing Tournament . 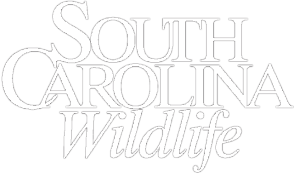 . . spotting herons and belted kingfishers at Kings Mountain and the beaver lodge at Sesqui . . . or just lounging in your boat after a refreshing seasonal swim in Paris Mountain's Lake Placid or Table Rock's Pinnacle Lake. And you don't even have to own a boat to do it!